In late 2013, the Office of Utilities Regulation (OUR) named three preferred bidders for the supply of up to 115 MW (megawatts) of electricity generation capacity from renewable energy. The three preferred bids amounted to a total 78 MW of energy only renewable energy capacity, including two projects offering energy from wind amounting to 58 MW, and one offering solar amounting to 20 MW. The proposed delivery price to the grid ranged from US$0.1290 to US$0.1880. 3. WRB Enterprises Inc., to supply 20 MW of capacity from Solar PV from facilities in Content Village, Clarendon. The 20 MW solar farm will be the first of its kind in the Island, however Jamaica’s first grid-connected wind-powered generator was commissioned in February 1996 at Munro College. This wind turbine-generator, a Vestas V27 – 225 kW, was also the first grid-connected wind-energy source in the English-speaking Caribbean. The project was funded primarily by the Environmental Foundation of Jamaica (EFJ), but also included a long list of local companies and individuals. The total installation cost of the facility was US$300,000. However, much of the local services, such as JPSCo’s services and Alpart’s crane services, were donated free of cost. The overwhelming success of the the Munro College wind turbine encouraged the Petroleum Corporation and the Government of Jamaica to commission Jamaica’s first large scale wind farm at Wigton (in the parish of Manchester) in 2004. The initial 20.7 MW wind farm, which came to be known as Wigton I, comprises of twenty three (23) NEG Micon NM52 – 900 kW wind turbines. The project was financed at a total cost of US$26.2 million with equity injection of US$ 3.2 million from the Petroleum Corporation of Jamaica (PCJ), a US$ 16 million loan from the National Commercial Bank of Jamaica (NCB) and a grant of US$ 7.0 million from the Netherlands Government. A midst several changes, including $150 million in lost revenues due to unfavorable energy rates and $120 million due to penalties imposed by JPS for reactive power demand and a fail divestment attempt in early 2007, the Wigton wind farm was expanded during the period 2009 to 2010 to include nine (9) Vestas V80 -2.0 MW wind turbines. The 18 MW project, now called Wigton II, was financed from the PetroCaribe Development Fund at total cost of US$49.9 million. In late 2010, JPS (the owner and operator) commissioned its first wind project – a 3 MW wind farm at Munro, St. Elizabeth. This project comprises of four (4) UNISON U50 – 750 kW wind turbines and was completed at a total cost of US$9.3 million. The Munro wind farm interconnects to JPS 24kV distribution system unlike the Wigton wind farms, which interconnects to JPS 69kV system via a 11km long tie-line. It is worthwhile noting that the grid interconnection cost can account for as much as 8-9% of the total project cost. In the case of the Wigton wind farms the 11kM 69kV line was included in the capital cost of the initial project. The two new wind farms coming out of the OUR latest request for renewable energy in addition to the national grid are projected to cost US$40 million for the WWF’s (Wigton Windfarm) 24 MW wind farm and US$90 million for the BMR’s (Blue Mountain Renewables) 34 MW wind farm. The cost of these two project forces me to ask one key question “how does public vs private investor wind power projects costs compare?”. I thought that a good way to get a fair comparison was to look at the projects that had/have the same/similar time horizon. 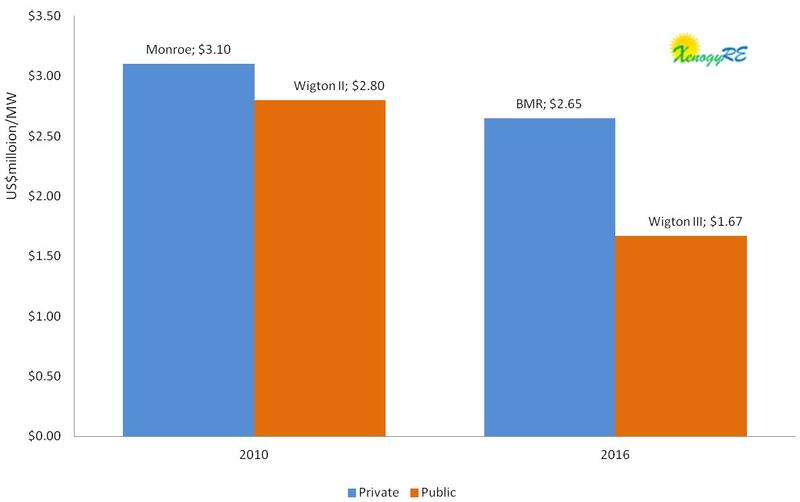 So, I decided to firstly compare the Wigton II and JPS Munro wind farm projects (which were both commissioned in 2010) and secondly the proposed Wigton III and BMR Munro wind farm projects (both scheduled to be commission in 2016), as shown below. 1. Private investor wind projects in Jamaica cost more than public wind projects. In the first case, the JPS Munro wind farm cost approximately 1.1 times the cost of the Wigton II wind farm on a per megawatt basis. Similarly, the proposed BMR Munro wind farm will cost approximately 1.6 times the proposed Wigton III wind farm on a per megawatt basis. It would be good to see a breakdown of the project cost to see exactly where the projects varied in term of cost. 2. The cost of wind power has come down by 40% for public projects and 15% for private projects since 2009. The cost of a wind project has a lot to do with its total size (economics of scale) however the most common way to compare wind project cost is on a per megawatt basis, as was done here. It is also worthwhile to add that the basic cost components of wind projects typically include: turbine cost, grid interconnection, foundation, electrical installation, consultancy, financial cost, road construction, control systems, etc. The inserted table gives a break down of the % share of the total cost for each component. Public projects, in most cases, could have a competitive advantage in terms of the land rental, financial cost and road construction components which could possibly explain to some extent why public projects have been carrying lower project cost compared to the few private projects that we have seen in Jamaica’s recent renewable energy history.